Going green is a popular trend these days, and by going green you are helping conserve our natural resources. Fortunately for homeowners, the by-product of conserving natural resources is often a reduction in monthly heating and cooling bills. The home services industry (i.e. heating & cooling and plumbing) offers products on the market today that are more efficient than ever. By choosing these energy efficient products you can save money and “go green” without losing anything in home comfort. “The term ‘energy efficiency’ is heard a lot these days and what it means to homeowners is that they can get the same amount of comfort, or hot water, while using less energy and reducing greenhouse gas emissions,” states Kevin Perri, President of A.J. Perri, a local heating, cooling and plumbing company. According to experts, energy efficient choices can save families about one-third of their energy bill with similar savings of greenhouse gas emissions – without sacrificing features, style or comfort. This allows you to save money in lower heating and cooling costs while doing something positive for the environment. 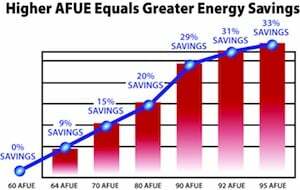 The minimum efficiency allowed by the government is an 80% AFUE. What this rating means is that 80% of the energy output used goes to heating your home and 20% goes out the chimney as waste. 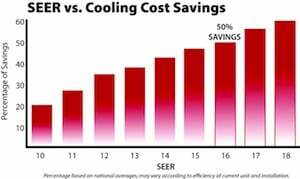 Carrier®, a leading heating and cooling manufacturer, offers systems with efficiencies as high as 96.6% AFUE. With a high efficiency system very little energy is wasted.